The Carolina Panthers are a professional American football team based in Charlotte, North Carolina. They play in the South division of the National Football Conference (NFC), one of the two conferences in the National Football League (NFL). The team is worth approximately USD $1 billion, according to Forbes, and is controlled by Jerry Richardson and his family; they have a 48% stake. The remainder of the team is held by a group of 14 limited partners. The head coach is Ron Rivera, while the president is Danny Morrison. The Panthers first competed in 1995 and fared well in their first two years, finishing 7–9 in 1995 (an all-time best for an expansion NFL team's first season) and 12–4 in 1996. They did not have another winning season until 2003, when the team won the NFC Championship Game and reached Super Bowl XXXVIII, losing 32–29 to the New England Patriots. After recording playoff appearances in 2005 and 2008, the team failed to record another playoff appearance until 2013, when they finished with a 12–4 record and won the NFC South. The Panthers have made the playoffs five times, reaching the NFC Championship Game in three of them. They have won four division titles, one of them in the NFC West and three of them in the NFC South. The Carolina Panthers are legally registered as Panthers Football, LLC. The team is headquartered in Bank of America Stadium, located in uptown Charlotte; the stadium also serves as the team's home field. The Panthers are one of the few teams in the NFL to own the stadium they play in, which is legally registered as Panthers Stadium, LLC. The Panthers are supported throughout the Carolinas; although the team has played their home games in Charlotte since the completion of their stadium in 1996, they played home games in Clemson, South Carolina, during their first season, and they host their annual training camp in Spartanburg, South Carolina. 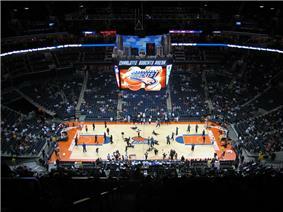 At home games, the atmosphere has been described as comparable to that of other NFL teams, with some games playing host to a large number of fans of the opposing team; this has been attributed to several factors, such as the city's relatively recent entry into the NFL, the popularity of basketball in the Charlotte region, and the large number of Charlotte residents who are originally from other cities with NFL teams. The Panthers' uniforms consist of black, white, and blue jerseys paired with white and silver pants, a pattern which has only seen minor changes since the team's inception. The team maintains rivalries with the three other teams in the NFC South, in addition to having out-of-division rivalries with the Arizona Cardinals and Dallas Cowboys. On December 15, 1987, entrepreneur Charlotte Hornets of the National Basketball Association (NBA). Richardson founded Richardson Sports, a partnership consisting of himself and his family; a number of businessmen from North and South Carolina were also recruited to be limited partners in the group. Richardson looked at four potential locations for a stadium, ultimately choosing uptown Charlotte. To highlight the demand for professional football in the Carolinas, Richardson Sports held a preseason game in the region in 1989, 1990, and 1991. The first two games were held in Carter-Finley Stadium in Raleigh, North Carolina, and Kenan Memorial Stadium in Chapel Hill, North Carolina, respectively, while the third and final game was held at Williams-Brice Stadium in Columbia, South Carolina. The matchups were between existing NFL teams. In 1991, the group formally filed an application for the open expansion spot, and on October 23, 1993, the 28 NFL owners unanimously named the Carolina Panthers as the 29th member of the NFL. The Panthers first competed in the 8–8 record in 1999. However, the team finished 7–9 in 2000 and fell to 1–15 in 2001, winning their first game but losing their last 15. This performance tied the NFL record for most losses in a single season and it broke the record held by the winless 1976 Buccaneers for most consecutive losses in a single season (both records have later been broken by the 2008 Lions), leading the Panthers to fire Seifert. After the NFL's expansion to 32 teams in 2002, the Panthers were relocated from the NFC West to the newly created NFC South division; The Panthers' rivalries with the Atlanta Falcons and New Orleans Saints were maintained, but they would be joined by the Tampa Bay Buccaneers from the NFC Central (now known as the NFC North). New York Giants defensive coordinator John Fox was hired to replace Seifert and led the team to a 7–9 finish in 2002. Although the team's defense gave up very few yards, ranking the second-best in the NFL in terms of yards conceded, they were hindered by an offense that gained very few yards, ranking as the second-worst in the league in terms of yards gained. The Panthers improved to 11–5 in the 2003 regular season, winning the NFC South and making it to Super Bowl XXXVIII before losing to the New England Patriots 32–29 in what was immediately hailed by sportswriter Peter King as the "Greatest Super Bowl of all time". King felt the game "was a wonderful championship battle, full of everything that makes [football] dramatic, draining, enervating, maddening, fantastic, exciting" and praised, among other things, the unpredictability, coaching, and conclusion. The game is still viewed as one of the best Super Bowls of all time, and in the opinion of Charlotte-based NPR reporter Scott Jagow, the Panthers' Super Bowl appearance represented the arrival of Charlotte onto the national scene. Following a rocky 1–7 start in 2004, the Panthers rebounded to win six of their last seven games despite losing 14 players for the season due to injury. They lost their last game to New Orleans, finishing the 2004 season at 7–9. Had they won the game, the Panthers would have made the playoffs. The team improved to 11–5 in 2005, finishing second in the division behind Tampa Bay and clinching a playoff berth as a wild-card. In the first round of the playoffs, the Panthers went on the road to face the New York Giants, beating them 23–0 for the NFL's first playoff shutout against a home team since 1980. The following week, they beat Chicago 29–21 on the road, but lost key players Julius Peppers, a defensive end, and DeShaun Foster, a running back, who were both injured during the game. The Panthers were then defeated 34–14 by the Seattle Seahawks in the NFC Championship Game, ending their season. Although the Panthers went into the 2006 season as favorites to win the NFC South, they finished with a disappointing 8–8 record. The team finished the 2007 season with a 7–9 record after losing quarterback Jake Delhomme early in the season due to an elbow injury. In 2008, the Panthers finished with a 12–4 regular season record, winning the NFC South and securing a first-round bye. However, they were eliminated in the divisional round of the playoffs, losing 33–13 to the Arizona Cardinals after Delhomme turned the ball over six times. Delhomme's struggles carried over into the 2009 season, where he threw 18 interceptions in the first 11 games before breaking a finger in his throwing hand. The Panthers were at a 4–7 record before Delhomme's season-ending injury, and his backup, Matt Moore, led the team to a 4–1 finish to the season for an 8–8 overall record. In 2010, after releasing Delhomme in the offseason, the Panthers had the worst record (2–14) and the worst offense in the league. John Fox's contract expired after the season ended, and the team did not retain him or his staff. 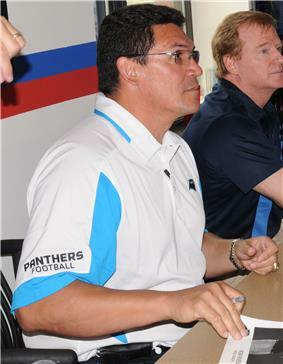 They hired Ron Rivera to replace Fox as head coach and drafted Auburn quarterback Cam Newton with the first overall pick in the 2011 NFL Draft. The Panthers opened the 2011 season 2–6, but finished with a 6–10 record, and Newton was awarded the AP Offensive Rookie of the Year award after setting the NFL record for most rushing touchdowns from a quarterback (14) in a single season and becoming the first rookie NFL quarterback to throw for over 4,000 yards in a single season. He also was the first rookie quarterback to rush for over 500 yards in a single season. In 2012, the Panthers again opened the season poorly, losing five out of their first six games, leading longtime general manager Marty Hurney to be fired in response. The team slid to a 2–8 record before winning five of their last six games, resulting in a 7–9 record. This strong finish helped save Rivera's job. The Panthers would have a winning season the following year, finishing with a 12–4 record and winning their third NFC South title and another playoff bye, however they would be beaten by the 49ers in the Divisional Round. The Carolina Panthers' original logo was used from 1995 to 2011. In choosing the team name, the Richardsons did not run focus groups with potential fans. Their intention had always been the 'Panthers'; Jerry Richardson began driving a car with the license plate 'PNTHRS' near the end of 1989. By the time they had been announced as the 29th NFL team in October 1993, the Panthers' logo and helmet design had already been finalized, but the uniform design was still under creation. After discussion, the Panthers organization decided on jerseys colored white, black, and blue, and pants colored white and silver. The exact tone of blue, which they decided would be "process blue" (a shade lighter than Duke's and darker than North Carolina's), was the most difficult color to choose. The team's uniform has remained largely the same since its creation, with only minor alterations such as changing the sock color of the team's black uniforms from blue to black and changing the team's shoes from white to black. Richardson, a self-described traditionalist, has said that no major uniform changes will be made in his lifetime; the Panthers did, however, change their logo and logotype in 2012, the first such change in team history. According to the team, the changes were designed to give their logo an "aggressive, contemporary look" as well to give it a more three-dimensional feel. The Panthers have three main jersey colors: black, white, and blue. Their blue jerseys, designated their alternate uniforms, are the newest and were introduced in 2002. NFL regulations allow the team to use the blue jersey up to two times in any given season. In all other games, the team must wear either their white or black jerseys; in NFL games, the home team decides whether to wear a dark or white jersey, while the away team wears the opposite. The Panthers typically pair their white jerseys with white pants, while the black and blue jerseys are paired with silver pants; there have been only a few exceptions to these combinations. The first such instance was in 1998, when the team paired their white jerseys with silver pants in a game against the Indianapolis Colts. The second instance was in 2012 during a game against the Denver Broncos, when they paired their black jerseys with black pants; this created an all-black uniform, with the exception of blue socks and silver helmets. The decision to wear blue socks was made by team captain Steve Smith, who felt the blue socks gave the uniforms a more distinct appearance compared with other teams that have all-black uniforms. The all-black uniforms won the "Greatest Uniform in NFL History" contest, a fan-voted contest run by NFL.com in July 2013. According to the team's equipment manager, Jackie Miles, the Panthers intend to use the all-black uniforms more in the future. The Panthers have worn the all-black uniform twice over the 2013 season, the first time being in a preseason game against the Philadelphia Eagles and the second being in a regular-season game against the New York Jets. The team has announced the all black combo will be used for the home divisional round playoff game on January 12, 2014. The team's uniform did not change significantly after Nike became the NFL's jersey supplier in 2012, but the collar was altered to honor former Panthers player and coach Sam Mills by featuring the phrase "Keep Pounding". Nike had conceived the idea, and the team supported the concept as a way to expose newer fans to the legacy of Mills, who died of cancer in 2005. Mills had introduced the phrase, which has since become a team slogan, in a speech that he gave to the players and coaches prior to their 2003 playoff game against Dallas; in the speech, Mills compared his fight against cancer with the team's on-field battle, saying "When I found out I had cancer, there were two things I could do – quit or keep pounding. I'm a fighter. I kept pounding. You're fighters, too. Keep pounding!" An exterior view of Bank of America Stadium. 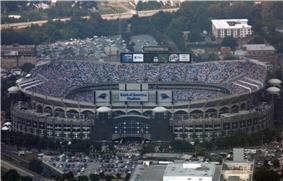 Bank of America Stadium is located in uptown Charlotte and can seat over 73,000 people. The Panthers played their first season at Memorial Stadium in Clemson, South Carolina, as their facility in uptown Charlotte was still under construction. 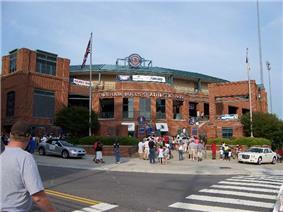 Ericsson Stadium, called Bank of America Stadium since 2004, opened in the summer of 1996. It was primarily financed by the Panthers, and they raised money largely through the sale of permanent seat licensess (PSLs); they paid $248 million for the stadium's construction, the entirety of the stadium's cost, while the city of Charlotte paid $60 million for "land and infrastructure developments". In February 2013, the city of Charlotte tentatively agreed to a $250 million improvement package for the stadium, with half to be paid by the city and the other half to be split by the State of North Carolina and the Panthers. This deal would have required the Panthers to remain in Charlotte for the next 15 years and would have been funded by a 1 percent increase in Charlotte's food and beverage tax. This deal was contingent on the North Carolina State Legislature approving the increase, but neither the legislature nor governor Pat McCrory supported it. In April 2013, the Charlotte City Council unanimously approved a scaled-down $87.5 million package, to be paid over six years with a six-year agreement from the Panthers to remain in Charlotte. The money will go to build escalators to help fans reach the stadium's upper deck, as well as to buy new video boards and to improve the sound system. Bank of America Stadium is owned entirely by the Panthers, making them one of the few teams in the NFL to own the facility they play in. The stadium was specially designed by HOK Sports Facilities Group for football and has a seating capacity of 73,778. It also serves as the headquarters and administrative office of the Panthers. On some days of the week, the stadium offers public tours for a fee. Private tours for groups are offered for a fee seven days a week, though there are some exceptions, and such tours must be arranged in advance. Two bronze panther statues flank each of the stadium's three main entrances; they are the largest sculptures ever commissioned in the United States. The names of the team's original PSL owners are engraved on the base of each statue. The two people in the Panthers Hall of Honor, team executive Mike McCormack and linebacker Sam Mills, are honored with life-sized bronze statues outside the stadium. Mills, in addition to being the only player in the Hall of Honor, is the only player to have had his jersey number (#51) retired by the Panthers. 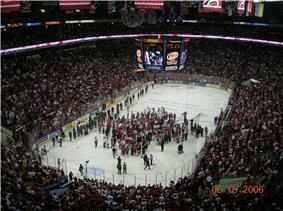 In addition to hosting home games for the Panthers, Bank of America Stadium has hosted other events. It hosts two college football games annually, the ACC Championship Game and the Belk Bowl. The stadium has also hosted international soccer friendlies, the NCAA Men's College Cup, and concerts. It was intended to host the final night of the 2012 Democratic National Convention, but the event was moved to nearby Time Warner Cable Arena due to concerns over stormy weather. 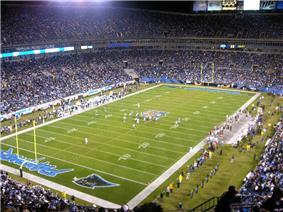 The Panthers have three open-air fields next to Bank of America Stadium where they currently hold their practices; during the 1995 season, when the team played their home games in South Carolina, the team held their practices at  In order to prevent people from seeing inside the field while the team is practicing, the team has added "strategically planted trees and a tarp over the ... fence surrounding the fields". Additionally, they employ a security team to watch for and chase away any people who stop alongside the fence surrounding the field. In the event of bad weather, the team moves their practices to an indoor sports facility about 10 miles from the stadium. The team does not own this facility. The Panthers have hosted their annual training camp at Wofford College in Spartanburg, South Carolina, since 1995. Pat Yasinskas of Atlanta". They also observed that the stadium has scattered parking lots, each of which has a different tailgating style. Some have fried chicken, pork, or Carolina-style barbecue, while others have live bands and televisions. Pickup football games in the parking lots are common, but fans tend to "behave themselves", in part due to blue laws that prevent the sale of alcohol before noon on Sundays. The Carolina Panthers have sold out all home games since December 2002, and their home attendance has ranked in the top ten in the NFL since 2006. The Panthers recorded the sixth-highest home attendance numbers in the NFL during the 2012 season, averaging 73,293 fans per home game. Sir Purr, an anthropomorphic black cat who wears a jersey numbered '00', has been the Panthers' mascot since their first season. During games, Sir Purr provides sideline entertainment through skits and "silly antics". The mascot participates in a number of community events year-round, including a monthly visit to the patients at Levine Children's Hospital. Sir Purr also hosts the annual Mascot Bowl, an event which pits pro and college mascots against each other during halftime at a selected Panthers home game. The team's cheerleaders are the Carolina Topcats, a group of 24 women who lead cheers and entertain fans at home games. The TopCats participate in both corporate and charity events. The team's drumline is Purrcussion, an ensemble of snare, tenor, and bass drummers as well as cymbal players. Purrcussion performs for fans outside the stadium and introduces players prior to home games; it consists of drummers from across the Carolinas. During the inaugural season of the Panthers, the team had an official fight song, which the team played before each home game. The song, "Stand and Cheer", remains the team's official fight song, but the team does not typically play it before home games. In recent years, the team has played Neil Diamond's "Sweet Caroline" immediately after home victories. The Carolina Panthers support a variety of non-profits in North and South Carolina through the Carolina Panthers Charities. Four annual scholarships are awarded to student athletes through the Carolina Panthers Graduate Scholarship and the Carolina Panthers Players Sam Mills Memorial Scholarship programs. Carolina Panthers Charities also offers grants to non-profits that support education, athletics, and human services in the community. The Panthers and Fisher Athletic has provided six equipment grants to high school football teams in the Carolinas each year since 2010. Carolina Panthers Charities raises funds at three annual benefits: the Countdown to Kickoff Luncheon, the team's first public event each season; Football 101, an educational workshop for fans; and the Weekend Warrior Flag Football Tournament, a two-day non-contact flag football tournament. Another annual benefit is Taste of the Panthers, a gourmet food tasting which raises funds for Second Harvest Food Bank of Metrolina. In 2003 the Panthers and Carolinas HealthCare Foundation established the Keep Pounding Fund, a fundraising initiative to support cancer research and patient support programs. The Panthers community has raised more than $1.4 million for the fund through direct donations, charity auctions, blood drives, and an annual 5k stadium run. The Panthers and Levine Children's Hospital coordinate monthly hospital visits and VIP game-day experiences for terminally ill or hospitalized children. In addition to these team-specific efforts, the Panthers participate in a number of regular initiatives promoted by the NFL and USA Football, the league's youth football development partner. These include USA Football Month, held throughout August to encourage and promote youth football; A Crucial Catch, the league's Breast Cancer Awareness Month program; Salute to Service, held throughout November to support military families and personnel; and PLAY 60, which encourages young NFL fans to be active for at least 60 minutes each day. Radio coverage is provided by Mick Mixon, Eugene Robinson, and Jim Szoke. The radio network broadcasts pre-game coverage, games with commentary, and post-game wrap-ups. It also live-broadcasts Panther Talk, a weekly event at Bank of America Stadium which offers fans a chance to meet a player and ask questions of the staff. National broadcasting and cable television networks cover regular season games, as well as some color analyst Mike Rucker, and sideline reporter Pete Yanity. The network also hosts The Panthers Huddle, a weekly show focusing on the Panthers' upcoming opponent. Panthers Gameday, the Panthers' postgame show, is hosted by sports anchor Russ Owens and former Panthers lineman Kevin Donnalley on WCNC-TV. The Panthers have developed a number of rivalries during their time in the NFL, including heated ones with the three fellow members of the NFC South (the Atlanta Falcons, Tampa Bay Buccaneers, and New Orleans Saints). The team's fiercest rivals are the Falcons and Buccaneers. The Falcons are a natural geographic rival for the Panthers, as Atlanta is only 230 miles (370 kilometers) and five hours south on I-85. Indeed, games between the two teams feature thousands of visiting-team fans following their team up and down I-85. The two teams have played each other twice a year since the Panthers joined the league, first as members of the NFC West and currently in the NFC South. The Panthers' rivalry with Tampa Bay is perhaps one of the better rivalries in the NFC South. The rivalry originated in 2002 with the formation of the NFC South, but became particularly heated before the 2003 season with verbal bouts between players on the two teams. It escalated further when the Panthers went to Tampa Bay and beat them in what ESPN.com writer Pat Yasinskas described as "one of the most physical contests in recent memory". The rivalry has resulted in a number of severe injuries for players on both teams, some of which have been caused by foul play. One of these plays, an illegal hit on Tampa Bay punt returner Clifton Smith, sparked a brief melee between the two teams. Outside the division, the Panthers have several other rivals. During their time in the NFC West, the Panthers began developing a rivalry with the San Francisco 49ers. However, this rivalry faded after the NFL moved the Panthers out of the NFC West. The Panthers maintain rivalries with the Arizona Cardinals and Dallas Cowboys, both of whom the Panthers play frequently. The Pro Bowl is the annual all-star game of the NFL. Pro Bowl rosters are determined by a combination of fan, player, and coach voting. The Carolina Panthers Hall of Honor was established in 1997 to honor individuals for their contributions to the Carolina Panthers organization. Each inductee is honored with a life-sized bronze statue outside of Bank of America Stadium's North Entrance, while the names of each original PSL owner are written on the black granite base at each of the six panther statues. A rule added in the mid-2000s by the Panthers organization requires all potential inductees to be retired for at least five years before they are eligible for induction. The members of the Carolina Panthers Hall of Honor are Mike McCormack, who was inducted on September 21, 1997, for his contributions to the team as an executive and general manager; Sam Mills, who was inducted on September 27, 1998, for his contributions to the team as a linebacker; and the team's PSL owners, who were inducted on September 13, 2004. Nominees for the Pro Football Hall of Fame, which "honor[s] individuals who have made outstanding contributions to professional football", are determined by a 46-member selection committee. At least 80% of voters must approve the nominee for him to be inducted. Reggie White, who played defensive end for the Panthers during the 2000 season, is currently the only Panther in the Hall of Fame. Jerry Richardson is the owner and founder of the Carolina Panthers. Richardson and his family own about 48% of the team,[upper-alpha 1] with the remaining 52% owned by a group of 14 limited partners. Richardson paid $206 million for the rights to start the team in 1993; according to Forbes, the Panthers are worth approximately $1 billion as of 2012. They ranked the Carolina Panthers as the sixteenth-most valuable NFL team and the twenty-third most valuable sports team in the world. Mike McCormack, a Hall of Fame lineman for the Cleveland Browns and former coach and executive for the Seattle Seahawks, was the Panthers' first team president, presiding in that role from 1994 until his retirement in 1997; McCormack was inducted as the first person in the Carolina Panthers Hall of Honor later that year. Jerry Richardson's son, Mark, was appointed as the team's second president in 1997 and served in that role until he stepped down in 2009. His brother Jon, who had been president of Bank of America Stadium, stepped down at the same time. The resignations of Mark and Jon Richardson were unexpected, as it was thought that the two would eventually take over the team from their father. Mark Richardson was replaced by Danny Morrison, who had previously served as the athletic director of Texas Christian University. The Carolina Panthers have had four head coaches. Dom Capers was the head coach from 1995 to 1998 and led the team to one playoff appearance. Counting playoff games, he finished with a record of 31–35 (.470). George Seifert coached the team from 1999 to 2001, recording 16 wins and 32 losses (.333). John Fox, the team's longest-tenured head coach, led the team from 2002 to 2010 and coached the team to three playoff appearances. Including playoff games, Fox ended his tenure with a 78–74 (.513) record, making him the only Panthers coach to finish his tenure with the team with a winning record. Ron Rivera, the team's current head coach, has held the position since 2011 and has a career record of 25 wins and 23 losses (.521), current as of the end of the 2013 regular season. Since they began playing football in 1995, the Panthers have been to three NFC Championship Games; they lost two (1996 and 2005) and won one (2003). The Panthers have won four division championships: the NFC West championship in 1996 and the NFC South championship in 2003, 2008 and 2013. They have finished as runners-up in their division six times, finishing second-place in the NFC West in 1997 and 1999 and finishing second-place in the NFC South in 2005, 2006, 2007, and 2012. They have qualified for the playoffs four times, most recently in 2013. Kicker John Kasay is the team's career points leader. Kasay scored 1,482 points during his 16 seasons (1995 to 2010) with the Panthers. 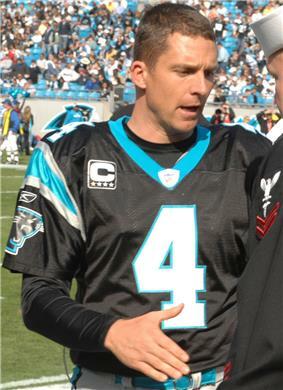 Quarterback Jake Delhomme, who played with the team from 2003 to 2009, is the career passing leader, having thrown for 19,258 yards over his seven seasons with the team. Running back DeAngelo Williams is the career rushing leader for the Carolina Panthers. Williams, who has played with the team since they drafted him in 2006, has rushed for 5,784 yards with the Panthers. Wide receiver Steve Smith, the team's leading receiver, recorded 12,197 receiving yards during his 13-year (2001 to 2013) tenure with the team. ^ Under NFL rules, an NFL owner and his family only need to control 30% of a team to be considered the team's controlling owner. ^ a b Person, Joseph (January 5, 2011). "Panthers owner looks back, ahead". ^ a b "Carolina Panthers". ^ "Panthers Football, LLC". North Carolina Department of the Secretary of State. January 1, 2000. Retrieved January 30, 2013. ^ "Panthers Stadium, LLC". North Carolina Department of the Secretary of State. July 16, 2002. Retrieved January 30, 2013. ^ a b c d e "Chronology". Team History. Carolina Panthers. Retrieved January 19, 2013. ^ Hoffer, Richard (October 28, 1991). "The Franchise". ^ a b Swan, Gary (September 19, 1996). "Carolina's Davis Has His Hands Full Again / Former 49ers corner renews duel with Rice". ^ Caldwell, Dave (November 3, 1994). "Nfl Owners Decide Against Realignment Complications Carolina Panthers "Slotted" To Nfc West. Jacksonville Jaguars Go To Afc Central.". ^ a b "Panthers let Capers go after dismal 4–12 season". Sports Illustrated. ^ Don, Pierson (January 6, 1997). "Panthers Push Out Cowboys". ^ "1996 Green Bay Packers Statistics & Players". Pro-Football-Reference.com. Retrieved May 11, 2013. ^ "Panthers fire head coach Seifert after 1–15 season". Sports Illustrated. January 2, 2002. Retrieved January 29, 2013. ^ Banks, Don (May 22, 2001). "Seattle moved to NFC in approved realignment plan". Sports Illustrated. Retrieved September 1, 2013. ^ Fryer, Jenna (January 26, 2002). "Carolina hires Fox as new head coach". ^ Chadiha, Jeffri (September 1, 2003). "Carolina Panthers". Sports Illustrated. Retrieved January 29, 2013. ^ "Parcells can only do so much as Cowboys no match for Panthers". ^ "Top Ten Super Bowls: Super Bowl XXXVIII". ^ "Top 10 best Super Bowl games". ^ Fischer-Baum, Reuben (February 6, 2013). "What Was The Best Super Bowl Ever? Ranking All 47 Games According To Watchability". ^ Rothschild, Richard (January 30, 2012). "Grading all 45 Super Bowls". Sports Illustrated. Retrieved August 28, 2013. ^ "Carolina Panther's 'Wine and Cheese' Fans". ^ Bernstein, Viv (January 3, 2005). "Pro Football; New Orleans and Carolina Battle as if There's No Tomorrow, and There Isn't". The New York Times. Retrieved January 29, 2013. ^ "Panthers clinch berth, expend little effort vs. Falcons". ^ Bayless, Skip. "The Seahawks are far from super". ESPN.com. Retrieved January 29, 2013. ^ "Seahawks smash Panthers, clinch first Super Bowl in team history". ESPN.com. January 22, 2006. Retrieved January 29, 2013. ^ "Playoff-bound Saints rest key starters in loss to Panthers". ESPN.com. Retrieved January 29, 2013. ^ Yasinskas, Pat. "Delhomme sees silver lining in long rehab from elbow injury". ESPN.com. Retrieved January 29, 2013. ^ "Soaring Cardinals one game away from first Super Bowl berth". ESPN.com. January 10, 2009. Retrieved January 30, 2013. ^ "Report: Panthers won't fire coach, GM". ESPN.com. December 28, 2009. Retrieved January 30, 2013. ^ Odum, Charles (January 3, 2011). "Falcons beat Panthers 31–10, win home-field edge". ^ a b c "Ron Rivera knows he has to win". ESPN.com. January 29, 2013. Retrieved January 30, 2013. ^ Leahy, Sean (April 28, 2011). "Carolina Panthers select Cam Newton with No. 1 pick in NFL draft". ^ Wilner, Barry (February 4, 2012). "Cam Newton Wins 2012 Offensive Rookie Of Year". ^ "Cam Newton, Greg Hardy help Panthers clinch NFC South title". ^ a b Chandler, Charles (October 26, 2008). "Fifteen years of the Panthers". ^ Fowler, Scott (February 2, 2012). "Richardson tells Panther fan that helmets will change, uniforms won't". Scott Says. ^ "Panthers introduce refined logo". Carolina Panthers. January 29, 2012. Retrieved January 27, 2013. ^ a b "Wear your team jersey colors". Carolina Panthers. August 8, 2012. Retrieved January 27, 2013. ^ Strickland, Brian (September 28, 2012). "Fans ask about team morale, uniforms". Carolina Panthers. Retrieved January 27, 2013. ^ a b Strickland, Bryan (January 31, 2013). "When will Panthers be back in black?". Carolina Panthers. Retrieved July 21, 2013. ^ Henson, Max. "Notes: Committed to the Carolinas". Carolina Panthers. Retrieved January 27, 2013. ^ Fowler, Scott (July 24, 2013). "Panthers win Greatest Uniform Ever contest, and will now wear black more often". Scott Says. ^ Strickland, Brian (December 12, 2013). "Notes: Panthers to wear black pants". Carolina Panthers. Retrieved December 25, 2013. ^ Fowler, Scott (April 3, 2012). "Carolina Panthers' uniforms to honor Sam Mills legacy". ^ Harrison, Steve (September 19, 2012). "Charlotte to weigh money for Panthers' stadium upgrades". The Charlotte Observer. Retrieved January 19, 2013. ^ Bethea, April (February 8, 2013). "New city plan increases tax money for Panthers, ties team to Charlotte". The Charlotte Observer. Retrieved February 9, 2013. ^ "Charlotte votes to renovate". ESPN.com. ^ "Contact Us". Carolina Panthers. Retrieved January 19, 2013. ^ "Tours". Carolina Panthers. Retrieved January 19, 2013. ^ "Best Public Art in Uptown Charlotte". ^ a b c "Hall of Honor". Carolina Panthers. Retrieved January 19, 2013. ^ "Sam Mills III". Carolina Panthers. Retrieved September 9, 2013. ^ Bitter, Andy (December 2, 2011). "ACC to keep title game in Charlotte for two more years". ^ "History of the Bowl". Belk Bowl. Retrieved January 20, 2013. ^ Mason, Andrew (January 28, 2010). "International soccer comes to Charlotte". Carolina Panthers. Retrieved January 20, 2013. ^ "Stadium Facts". Carolina Panthers. Retrieved January 24, 2013. ^ a b Strickland, Brian (July 30, 2012). "Governor proclaims "Carolina Panthers Day" in S.C.". Carolina Panthers. Retrieved May 7, 2013. ^ a b Cranston, Mike (September 13, 2007). "Panthers fortify practice facility to keep out spies". USA Today. Retrieved January 25, 2013. ^ Yasinskas, Pat (May 4, 2009). "'"NFC South not big on 'bubbles. ESPN.com. Retrieved January 25, 2013. ^ Banks, Don (August 2, 2012). "Postcard from camp: Panthers". Sports Illustrated. Retrieved January 25, 2013. ^ Yasinskas, Pat (August 29, 2008). "Playoff drought leaves Dolphins' fans parched for a winner". ESPN.com. p. 3. Retrieved January 19, 2013. ^ "NFL Fan Value Experience". Sports Illustrated. November 7, 2007. Retrieved January 19, 2013. ^ Gantt, Darin (January 16, 2013). "Report: Richardson plans to have Panthers sold after he dies". ^ a b "NFL Attendance −2012". ESPN.com. Retrieved September 9, 2013. ^ "Mascot". Carolina Panthers. Retrieved January 22, 2013. 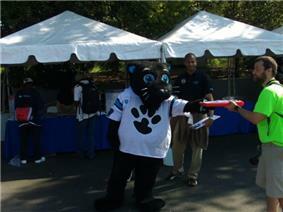 ^ "Sir Purr – Outreach". Carolina Panthers. Retrieved April 28, 2013. ^ "Cheerleaders". Carolina Panthers. Retrieved January 22, 2013. ^ "Drumline". Carolina Panthers. Retrieved January 22, 2013. ^ a b Squires, Chase (February 1, 2004). "Squad's '95 fans remember the team spirit". ^ "Stand and Cheer". Carolina Panthers. March 9, 2009. Retrieved September 9, 2013. ^ Sorenson, Tom (October 25, 2010). "Panthers like sweet sound of victory". ^ a b "Carolina Panthers Charities". Carolina Panthers. Retrieved September 9, 2013. ^ "Carolina Panthers – Fisher Athletic High School Equipment Grant" (PDF). Carolina Panthers. Retrieved September 11, 2013. ^ "Charity Events". Carolina Panthers. Retrieved September 9, 2013. ^ "Keep Pounding". Carolina Panthers. Retrieved September 9, 2013. ^ "Community". Carolina Panthers. Retrieved September 9, 2013. ^ "Radio". Carolina Panthers. Retrieved September 12, 2013. ^ "Television". Carolina Panthers. Retrieved September 12, 2013. ^ a b c Sorenson, Tom (September 28, 2008). "Sorensen: Falcons vs. Panthers is no rivalry". The Charlotte Observer. Retrieved January 22, 2013. ^ "Saints, Panthers rivalry deepening after New Orleans' 30–27 win". ^ Yasinskas, Pat (December 9, 2012). "Panthers score some points for Rivera". ESPN.com. Retrieved January 22, 2013. ^ a b Yasinskas, Pat (September 11, 2008). "NFC South's most intense rivalry: Panthers vs. Bucs". ESPN.com. Retrieved January 22, 2013. ^ a b Holder, Stephen F. (October 19, 2009). "Carolina Panthers cornerback Dante Wesley suspended for hit on Tampa Bay Buccaneers returner Clifton Smith". ^ Fowler, Scott (October 22, 2010). "My Panthers-49ers prediction". Scott Says. ^ Somers, Kent (October 31, 2009). "Cards, Panthers resume rivalry". ^ Eatman, Nick (October 19, 2012). "Cowboys-Panthers Rivalry Has Seen Interesting Twists & Turns". Dallas Cowboys. Retrieved January 22, 2013. ^ "Peyton Manning tops Tom Brady in fans' Pro Bowl voting". NFL.com. December 20, 2012. Retrieved April 28, 2013. ^ "Pro Bowl". Carolina Panthers. Retrieved January 28, 2013. ^ Fowler, Scott (May 9, 2013). "Panther Hall of Honor more like crawlspace". Scott Says. ^ "Selection Process". Pro Football Hall of Fame. Retrieved April 28, 2013. ^ "Reggie White". Pro Football Hall of Fame. Retrieved January 28, 2013. ^ Biggs, Brad (October 26, 2009). "Change in NFL ownership rules aids family-owned teams like Bears". ^ Badenhausen, Kurt (July 16, 2012). "Manchester United Tops The World's 50 Most Valuable Sports Teams". Forbes. Retrieved January 28, 2013. ^ Yasinskas, Pat (September 1, 2009). "Richardson's sons resign unexpectedly". ESPN.com. Retrieved January 29, 2013. ^ Person, Joe; Jones, Jonathan; Green Jr., Ron (September 2, 2009). "Danny Morrison file". Charlotte.com. Retrieved January 29, 2013. ^ "Head Coaches". Carolina Panthers. Retrieved April 28, 2013. ^ Yasinskas, Pat (August 31, 2012). "John Kasay back to Panthers? Doubt it". ESPN.com. Retrieved April 29, 2013. ^ "Playoff Game Summaries" (pdf). NFL.com. Retrieved January 14, 2013. ^ "Past Standings (1920–2011)". NFL.com. Retrieved February 27, 2013. ^ "Standings". NFL.com. Retrieved March 5, 2013. ^ Battista, Judy (December 22, 2013). "Cam Newton, Carolina Panthers hang tough, prove playoff mettle". NFL.com. Retrieved December 25, 2013. ^ a b c "All-Time Leaders". Carolina Panthers. Retrieved March 13, 2014. ^ a b "Carolina Panthers Head-to-Head Records".